All surfers are infatuated with the warm waters, hollow barrels, and native beauty of the Hawaiian Islands. Out in the lineup, it’s common to meet someone who became seduced by the Hawaiian surfer-lifestyle, moved to the Islands and never looked back. Stuart Coleman did just that. Home grown in the East Coast, Coleman was on the constant search for bigger waves and sunny weather. After landing a job that brought him to the Islands, Coleman decided to make his dream a reality and turn Oahu into his permanent vacation spot. In the past few years Coleman has published two books and has become the Hawaii Chapter Coordinator for Surfrider Foundation. Even with working on his upcoming book and Surfrider’s Rise Above Plastics Campaign, Coleman still finds time to surf and enjoy the slow-paced lifestyle Oahu has to share. A big mahalo to Stuart Coleman for sharing a little bit about his journey. LT: The first thought that comes to my mind whenever I meet someone from the East Coast that has made the journey to Hawaii is “this guy has got it right.” What sparked you, a South Carolina native, to move to Oahu and completely integrate yourself into surf culture? SC: I started surfing the menehune waves in Charleston, SC when I was 14, and it changed my life. Even though my dad was a minister, the ocean became my church. From then on, I read all the surf mags and dreamed of surfing bigger waves in California and Hawaii. I even had tsunami nightmares! I moved to SoCal after college and enjoyed surfing classic spots like Malibu. Then, after studying creative writing in grad school, I landed a job teaching English at Punahou School, and Honolulu has been my home ever since. So my dream of living in Hawaii finally came true. LT: In 2002 you published your book “Eddie Would Go” about the life of Hawaiian surf icon Eddie Aikau. What’s your interpretation on Eddie’s impact on what you refer to as the Hawaiian Renaissance? SC: As a surfer, Eddie was an amazing big-wave rider who rode some of the biggest waves ever surfed at Waimea Bay. As a waterman, Eddie became one of the first lifeguards on the North Shore and saved hundreds of lives during his career, never losing anyone under his watch. But when Eddie sailed on the Hokule’a and sacrificed his life to rescue his fellow crew members, that’s when he became an icon of the Hawaiian Renaissance. The Hokule’a embodied the resurgence of Hawaiian culture at that time, and he gave his life trying to save the voyaging canoe, its crew and the vision of the Hawaiian Renaissance. That sacrifice is what made him a real hero. LT: During your three years of research for the book, you had the rare opportunity to interview the Aikau family. Why do you think they were so willing to share their family story with you compared to the numerous other publications and documentaries that have approached them? SC: While teaching at Punahou, I met former teachers and big-wave pioneers Peter Cole and Fred Van Dyke, and they introduced me to the Aikau family. Seeing how passionate I was about telling Eddie’s story, they really opened up and started sharing these amazing stories about his life. After talking to them, I interviewed almost forty people, including the fellow lifeguards who worked with Eddie and the sailors who had sailed on the Hokule’a with Eddie. I think the family understood how much I respected Eddie’s legacy and was willing to do the extensive research to get the story right. 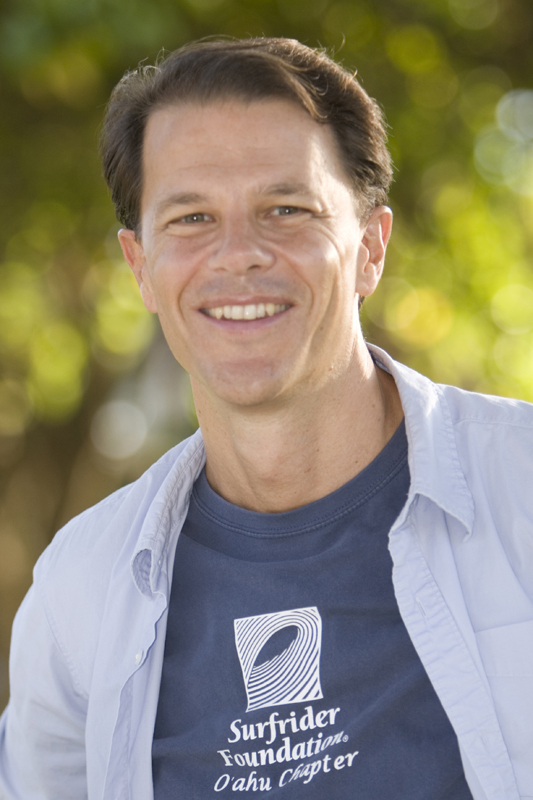 LT: In addition to being an accomplished author, you are also a prominent figure in the Surfrider Foundation. How did you end up becoming the Hawaii Chapter Coordinator? SC: I had worked as a volunteer for the Surfrider Foundation’s Oahu Chapter for eight years before finally becoming the Hawaii Coordinator position. At that time, I was also finishing my second book Fierce Heart and was writing about Rell Sunn’s work as a board member with the Surfrider Foundation. So my roles as a writer and environmental activist really came together at that point. LT: As an environmental activist, why do you think is it important that other surfers and watermen become involved with foundations like Surfrider? SC: Surfrider is one of the most prominent and effective environmental organizations in the country dedicated to protecting the world’s oceans, waves and beaches. With almost 80 chapters, our activists are always fighting for better water quality, beach access, conservation and coastal preservation. Yet it’s sometimes frustrating to see how many surfers take these things for granted until there’s a crisis at their local break. If surfers want to protect our beautiful coastal playgrounds, they should join Surfrider and help our efforts to save the last ocean frontier. SC: We have four Surfrider chapters in Hawaii on Oahu, Kauai, Maui and in Kona, and we have an active Surfrider Club at the University of Hawaii, Manoa. We are trying to start more Clubs at high schools and community colleges, and anyone can join by coming to one of our monthly meetings, beach cleanups or special events. We’re having a big Rise Above Plastics Party at the Waikiki Aquarium on Sat., March 26, and that should be a fun way to get our message out there and recruit new members because we throw some good parties! LT: What other events or projects are the Hawaii chapters working on? SC: Our biggest project right now is the Rise Above Plastics campaign because we’re trying to reduce the proliferation of single-use plastic bags and bottles. Americans go through more than 100 billion plastic bags each year, and on average we use them for about 15 minutes, and then they end up in landfills or in the ocean for hundreds of years. Seabirds, sea turtles and other animals mistake the floating plastic bags for jellyfish and eat them. Millions of marine creatures die each year to ingestion and entanglement of plastics. So to reduce the source of these land-based plastics, we need to ban or impose a small fee on single-use plastic bags. LT: John Kelly and George Downing paved the way for coastal protection groups with their organization Save Our Surf. Why was SOS so significant in the historical perspective of beach and ocean conservation? SC: John Kelly was the founder of Save Our Surf, and he used his status as a legendary waterman to educate people about the threats to our coastal areas. Along with George Downing and many young activists, they helped stop more than 300 projects that threatened Hawaii’s shorelines, including a proposed freeway built on the reefs over the ocean! Each November, Surfrider’s Oahu Chapter hosts our annual John Kelly Environmental Awards Party to honor those who have made a difference to our coastal environment. John Kelly was the first lifetime achievement winner, George Downing was the second, and we at Surfrider are following in their footsteps. LT: Can we expect another book from you in the near future? Perhaps on surf conservation? SC: I’m working on a new novel about a surfer whose brother is brutally beaten and almost killed, and he tries to find out who did it and why…well, I’d love to tell you more about it, but that wave is still building and can’t be ridden just yet! LT: Any plans on moving back to the mainland, or has the slow-paced rhythm of the Islands captured you? SC: Although I miss my family and friends on the mainland, Hawaii has gotten under my skin and seduced me with its warm water and beautiful beaches. LT: I recall reading you began surfing during your childhood and it helped overcome your fear of drowning. Have you succeeded in overcoming that fear? SC: Yes, I used to have a recurring nightmare about drowning as a kid, and I could see a huge wave rising on the horizon and washing away my hometown. Ironically, after the Indian Ocean tsunami in 2004, I saw my worst fears realized when I saw small coastal towns in Sri Lanka that had been devastated by walls of water almost 30 feet high. Staring at the rubble of buildings that were washed away, I rediscovered a healthy fear of the ocean. But surfing always helped me overcome those fears. LT: As an avid surfer, do you have any new fears that have arisen? Sharks? Spiky reefs? Polluted waters? SC: When I was living in SoCal and surfing in Malibu, I remember getting sick because the water quality was so bad at times. So my new fears are that our coastal areas will become so polluted that we can’t surf anymore without coming down with something. That’s partly why Rell Sunn got involved with Surfrider to help protect our beaches and water quality, and we’re fighting to keep that vision of healthy coastlines alive.